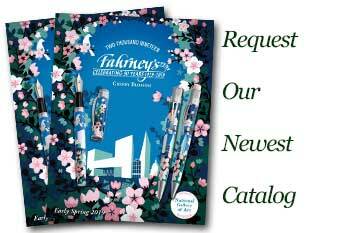 Order your Dupont Line D Lacquer Fountain Pen today from FahrneysPens.com. Fine Pens, Refills & Luxurious Gifts – great prices & fast shipping. Like the Parisian palace and the famous avenue for which it is named, the S.T. Dupont Elysee Lacquer fountain pen is a quintessentially French creation. Elysee is the new standard from the French luxury goods maker, a natural evolution of design elements from its past with the advantage of modern technology. The Elysee fountain pen profile is streamlined and elegant, featuring a Diamond Head pattern on the clip and precious metals on the wide bands and grip. The 12 layer lacquer process was exclusively engineered for the Elysee through a unique method passed down for generations that creates a highly-wear surface with a beautiful shine and depth of color. The black lacquer is appointed in rich gold or palladium plating, creating a sharp image that you will love to hold in your hand or keep in your pocket. On the crown of the Dupont Elysee fountain pen rests the signature Dupont ‘D’, symbol of precious metal and lacquer mastery. The Elysee fountain pen is fitted with Dupont's finest, extra-large 14K gold Orpheo nib for superb writing performance. The Dupont Elysee fountain pen accepts ink cartridges or converter.